I read somewhere that anime studios do their animation work followed by voice recording. Whereas, in Western animation, they pre-record the voice before doing animation so as to accurately draw the lip movements of the characters through the voice actors. I am wondering if it's still true, and if there are anime works which use the Western approach? I heard Natsuyuki Rendezvous pre-recorded their voice work before doing animation. 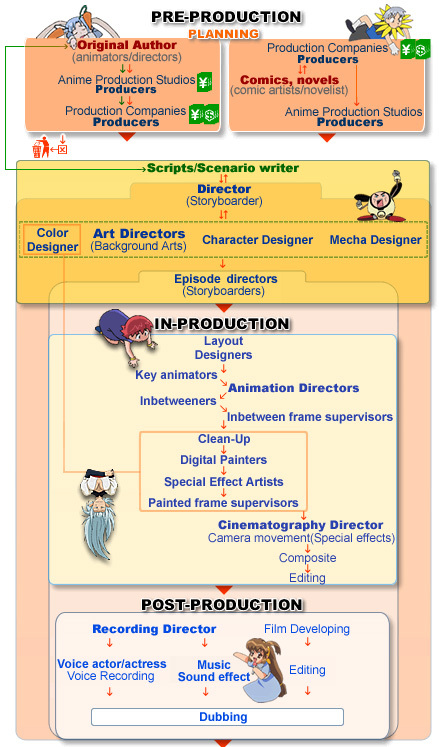 According to Washi's blog post from 2011 titled "Anime Production – Detailed Guide to How Anime is Made and the Talent Behind it! ", all of the voice work and sound recording happens in post production. These processes are compiled from studios like Sunrise, Production I.G., AIC, etc. A voice actor's role in anime consists of reading the lines before the production is finished. In Japan, the lines are usually performed before the anime has completed. The artist then draws in every expression to the key of the voice actors reading it off. This is the most common way of prerecording in Japan. But the passage lacks any citation. Additionally, voice actors are paid for a chunk of work, regardless of the number of lines or how long the session takes, so it's logistically easier to do it all in one go as opposed to being linked closer to the production of the actual animation. When the animation is (mostly) done, the voice acting and sound engineering can all be done in one go. Will the Japanese version RWBY remake the animation or just be changing the voice actors and actresses?